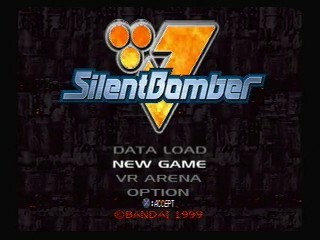 Released in 1999, Silent Bomber should not be confused with Bomberman. The game's plot is to destroy a space cruiser, known as the Dante, that is threatening a planet called Hornet. The hero is a war criminal who mostly has no emotions but who cares he is a flipping bomberman! He uses bombs instead of traditional weapondary, and upgrades and the like tha resemble bomberman so it's pretty cool. Best Time: 0:34:32 by 'burningsteel' on 2014-07-19, done in 14 segments. First allow me to explain the main route. The route is to get enough E-chips to get unlock 8 bomb stacks and 1 extra range. For the most part I get every single E-chip with a couple exceptions that are too out of the way (ex: Mission 3 has an E-Chip that costs over 5 seconds to get alone). By the end of mission 6 I need to have enough E-chips to be able to unlock 8 bomb stacks before the boss in Mission 7. I also need to get enough E-chips for an extra range before the mission 8 boss. Without the 8 stack you lose time on a lot of the later sections with enemies and bosses that have limited time frames to deal damage to them. Without the extra 1 range the Mission 8 boss, the waves of enemies in mission 11, and particularly the Mission 11 boss become much more difficult to defeat. Having that 1 extra range is just enough to be able to lock on to them. There will be no E-chips going towards shields since this is a segmented run. 1) Quick Item Pick Up - There is a short time frame where you can pick up items from "killed" containers right before they explode. A bit risky so good for a segmented run. Ex: Mission 1, and 2. 3) Remote Bomb Placement - It is possible to place bombs on enemies even though you are not locked on to them. With my limited range this has its uses particularly on unmoving targets. Ex: mission 1. 2) Stacked Paralysis Bombs - Mechanized units receive massive damage from stacked Paralysis bombs. Ex: mission 1, 7 bosses. These stacks bombs also have a massive range. Ex: Mission 3 stack kills all containers in an area. The paralysis effect is really only used in mission 13. 4) Killing off-screen - Most enemies and bosses and can be killed off-screen. Ex: mission 4 boss. The US version will be used instead of the Japanese version, because it gives you the option to skip the tutorial level which saves about a minute. I badly wanted to use the Japanese version since the voice acting was a bit better, even though it was still lifeless and amateurish. Everything went quite well. Got all the items I needed. Needed 2 paralysis items (each bomb item pick up gives you 5 bombs) to quick kill the boss, and that napalm does damage over time which is good to help kill stationary targets here. Also use the remaining napalm on next mission's boss. Perform 4 consecutive quick item pick ups. Kill the mini boss when he is partially off-screen. Kill the boss with a mix of paralysis, napalm and normal bombs. This mission will need some explanation since I may seem to do things oddly. First let me explain that the first bridge is not a good angle, I cannot just go up and left otherwise I bump into the railing, but I have to adjust myself. Second this first section lags for some reason, and is the only place in the game to do so. That is why there is a slight delay when I destroy the first couple containers. I played it enough to make corrections for the lag to prevent too much time loss. The second section uses a trick with the paralysis bombs that abuses their range and damage to destroy all the targets with a stack per area. The placement is rather precise, and I cannot move off-screen too much or the ones on the outer edges will not explode. I also deliberately do not get the E-chip all the way to right since it takes too long to get. Once all the containers are destroyed I go back down a level to get an E-chip during one of Anri's mad rants until she is kind enough to open the door for me. This mission requires some knowledge of how the enemies spawn, and how to activate the platforms to the next levels to do this quickly. The first floor enemies spawn predictably with certain input. Once all of the targets are dead you must be in that orange area near where the platform will appear to get it to come down. There is also some lag before the game recognizes that all the targets are dead for some reason. While the platform is coming down you have some down time to pick up the items on that level. The second and third floor spawn enemies with two methods. The first is by having them come out of launchers level with the floor, and the second is by having them come out of containers through the floor into two launch type areas. By placing remotely placing bombs it is possible to kill them before the enemies are actually able to move on the floor. This method works even on the special enemies on this level that you cannot easily lock on to either. The boss can be killed off-screen by careful off-screen remote bomb placement and detonation. The game kindly also moves me right near the door as well after the boss's defeat. The trick is to kill quickly kill those flying green ships to get the next platforms to come down. Near the end you have to protect the spaceship. That whole section is timed so I run off and get some pick ups. However if you let the ship take too much damage and let the characters talk it takes longer for the section to finish. This mission is terrible. The mission layout, the myopic overhead view of the first section, and the unique side view of the second section make this mission difficult. You will notice that instead of killing the lasers like a normal run would, I actually roll through them. There is not a lot of leeway in performing those rolls either. I make use of the fact that if you hit a wall while air dashing it cancels the dash in a couple places. Instead of using the paralysis bomb stack to kill this mission's boss quickly, I mix a single one with every other stack to kill this boss. It takes a couple seconds longer to kill it this way, but I am preserving them for mission 7's boss which saves a bunch of time. Objective is to kill the targets, get some e-chips to unlock the final 8 bomb stack, a paralysis item, wait for the woman to stop speaking and get in the door. At the end of the first section I kind of wander around for a couple seconds. Now with my paralysis stacks I get the boss down to a small amount of health. I jump off of the boss after the first stack because if you remain on it you get blown off. On the last stack I use 4 paralysis and 4 napalm, because while the boss burns to death from damage over time I take the opportunity to get an E-chip and make way to the exit. After getting the penultimate E-chip of this run I make it in time for the door to open and finish. This mission is almost entirely on this one moving platform where you have to kill waves of enemies. Kill the entire wave and the next wave comes. I try to do this as quickly as possible, and I wish I knew a way to kill all four of those floating enemies at once consistently. Even though I can only rarely kill all four enemies with a single bomb stack, I can usually wipe out 3 of them at once, and then clean up the last one. I get the final E-chip of the run here and put it on for an extra range since unlike the bombs they are not automatically allocated. This boss has a faster than usual way of killing it. After hitting the first two with a placed 8 stack, make sure to place an 8 stack on third Blue Mist and have him go back to his teammates once they finish their little homing ball creation they will start to move around randomly. When they are together at a point detonate the placed 8 bomb stack to hit all three. After they come up and attack you two of them should die, and the final one will do this rush attack. During that final rush attack detonating the final 8 bomb will kill it. That is the fastest way I could find out to kill this boss. Shortest section in the run but it takes some precise movement to get it down fast and without getting hit and wasting time. Since I do not need any item pickups in this level I just dash to the exit. Dash to the right and place enough bombs to go through the barrier and activate the pad to open the gate, get into the elevator at the end. On the lower floor I move as fast as I can to Anri's cell. Once inside safely the mission ends. Mission 10, the mission I dreaded the most originally before actually doing it. There are two hard things about this mission. The first is the bio-weapon enemies running around everywhere that you must kill. Each has 20 health, they have huge almost 180 degree attacks, they have ranged attacks, they jump and when they do they have an enormous hit box that can knock you down, they usually come in multiples, and some of them will knock you down sometimes when they explode for some unexplainable reason. The second hardest thing is how to get them to spawn fast. Each room has these strange loading zones and determining them is the key to getting the next enemy to appear where you want it to. If you move too fast and cause the next room to load before you finish killing the enemies in the room you are in currently then that room may not have any enemies when you go in it. Then you will have to backtrack to get enemies to spawn. Sometimes moving to a specific point in the room and breaking glass windows will cause enemies to spawn as well. You might be able to tell that I spent a significant amount of time running this mission. To do this level I make use of planting three 8 bomb stacks to kill the enemies for the most part. I do not usually remote place them on the enemies because it is highly risky, unreliable, and planting them is slightly faster overall. All of the rooms go very well with the room with six of the bio-weapon targets going average since the last one took a little moving around to come out. Before the boss I get some free item pick ups. With my range I cannot easily remote stack a lot of bombs on the boss so that is why you see me placing lots of them in little groups. I use gravity bombs to take care of the spiders which fall from the ceiling when you damage the boss. Those spiders will cause massive trouble if you do not deal with them. The boss goes down rather painlessly. To the next mission. Oh and sorry for the sound quality, this was the only recording I did that came out this way in months worth of recording for this game. This was my fastest attempt by a couple seconds. Fourth hardest mission in the game. This mission took a lot to get down properly. This whole run's minimum requirements are for this mission. The limited time frame to damage the enemies and that one extra range are all necessary for the boss and very helpful for the waves of enemies. The waves of Blue Mist are difficult enemies that tend to move in random patterns. While testing, the absolute best time I got with save state is near 16 seconds per wave knowing where they would go before hand, but for a human the best time I could get is near 20 seconds. For each wave I got almost 20 seconds flat for the first two waves and 21 seconds for the third waves, so I am quite pleased with that. After the second wave in this mission there is a very boring "wait" section. There is no objective, the only objective is to wait. There is nothing I need on this mission, so I park myself in a corner and kill everything that spawns near me while I wait for her to start to say the platform is ready to move. I do need to be on it before she finishes her statement to not waste time. The final wave has that rush move that the Blue Mist bosses had in mission 9, while the final enemy is ready to use that I count to 3 then detonate it, since I need him to start to move to get into the range of that remotely placed 8 stack. The boss is pretty hellish with this short range setup, but nowhere near as bad if I had no extra range. The boss has 39 bombs worth of health, and the only real way to deal damage to him is to place the bombs on those dangerous yoyos. The fastest way is to kill him within 5 cycles of yoyos throwing. Thanks to Senvy because I saw in his videos that you can damage the boss through his shield with large enough bomb stacks which slightly whittle the boss's health down. The boss seems to deal with damage in a special manner. If you place two stacks of bombs on the two yoyos, get them within his range and detonate them, only one stack will deal any damage. I do not know how it chooses which stack to take damage from, but it is an annoying quality of the boss. The reason for that is that it is common for the boss to throw out yoyos in a certain way so that they overlap on the platform you are on. When they are like that placing bombs randomly puts them on one of the two yoyos. So when they go back to the boss you may only deal the damage on one stack to the boss. If both stacks are around 4 bombs the run is pretty much over. Even with the stacking bombs and dealing small damage to the body it is hard to get enough of a buffer to kill the boss in only five cycles with that. In this fight the boss even started to go psycho on me from the start shooting rockets and energy blasts which is really unusual, when I saw that I thought it was over, but I pulled through. GG me. This is probably the second hardest mission after mission 14. This is a mission with a minimum time limit, 2 minutes and 45 seconds I believe. The trick is to prevent the mad woman, Anri, from taking too much damage, since her taking too much damage will cause her to start ranting and waste time. So, basically...keep the monsters off of Anri, get the item pick ups, most of which I do not even need and will not use, watch the timer, and when the timer is near 2:40 you can kill them without them re-spawning, and end it at 2:45. The enemies as you see are on something of a time leash, every x amount of seconds they have the sudden irresistible urge to physically assault Anri. By placing bombs on them at about the same time I can keep them on a leash and stop them from attacking Anri and instead attack me (joy). The hardest part is to lure the enemies near the final door, killing them, and placing myself near the opening of the door that you cannot even see due to the camera. Go out the door to end the mission. This took way more time than I thought it would. There are so many little spots to fail on this mission it is not even funny. There are way more bullets being spewed here than in any other part of the game. And even bullets coming at from off screen as well that sometimes have no sound with them. Anyway, the mission here is to destroy four motors in four rooms. The odd rooms are the easier of the two types of rooms. They have a motor on the lower level behind a electric gate that is lifted by detonating a bomb on a pad. In the odd rooms there are two pads, one just outside the gate and one inside underneath the large tank like enemy. After destroying the motor I explode some bombs on the tank to open up the gate again. The even rooms are harder rooms. They have two pads to open the gates that move up and down along the walls. The first section of an even room is a timed section, you have to wait for the first pad to come up so even if I take some time, not too much though, I do not actually lose any time here. When I get to the second electric gate on the bottom floor I detonate the pad on the wall, roll through use some paralysis bombs to stop the enemies from moving blow up the motor. Then detonate some bombs to activate the other pad in the room, the one underneath the tank. Then place another stack of bombs on the tank, but leave them there, and exit the room before the electric gate comes up again. When I make it all the way to the first electric gate on the top floor I would normally have to go to the right side of the room and wait for the pad to come up, but instead I can just detonate the bombs I laid on the tank and go through the gate without any waiting. The center area of the stage is a huge pain because of the moving camera that changes how you move. I make a mistake where I get caught on something and the dash to roll stops and instead of dashing towards a door I dash into the wall, wasted a second or two. Derp. Except for that mistake this was good. No need to get any items, 8 bomb stacks and one extra range will do fine. The chess game takes about 1 minute to complete. That one minute requires a lot of good bomb placement, but I got good at it after doing it for a couple hours. The chess game is completely predictable and easy once the correct placements are memorized. After killing the queen piece it is time for Benoit. Benoit is and always will be the hardest enemy in the game by far. Some games like doing this to players, where one boss's difficulty far outstrips the rest and this is one of them. he is not only evasive, but can deal high damage, and combine that with Benoit's highly unpredictable nature made this fight hell for me. To kill Benoit quickly I needed to try to hit him as much as possible in a short amount of time. What I need for this fight is luck and then skill, but mostly luck. I need Benoit to go over my 8 bomb stacks, not play keep-away, not dash away when I target him, and not spam his giant Hologram form too much. I got very lucky this time since he was very cooperative. He nicely ran over my 8 stacks, did not play keep away, did not dash away when targeted, and did not spam the Hologram too much. Final Notes: The final in-game save time is 34 minutes and 32 seconds. It has been fun doing this speed run for Silent Bomber if a little teeth-grinding at times. Hope this is enjoyable :).